As part of our alternative provision programme with students from the CE Academy, we help students work towards Arts Award qualifications. Part of the criteria for achieving a Bronze level award (equivalent to a passing grade at GCSE), means students are required to explore the arts as an audience member. In 2011 this exploration was quite literal as students explored the woods between Fermyn Woods Country Park and Lyveden New Bield, searching for a series of temporary artist installations and interventions which made up Encounters: Journeys through language and landscape. Starting at the country park, Shane Waltener‘s weavings distributed amongst the trees were enough to entice the students away from the zip wire and to begin their 3 mile journey. Rebecca Lee’s Great Chorus called out like a psiren, luring the galloping students into a clearing where they found an organ standing alone emanating music in the first of several reflective moments in the day. Arriving at Lyveden students were confronted by Jitish Kallat‘s faux dinosaur bones spelling out the message “When will you be happy”. One student replied, “I’ll never be happy”, a deeply sad moment with the silver lining that interventions like these can help students disclose personal feelings to those they trust in order to find the help they need. Sometimes reflections are just bravado, students wanting to save face rather than admit an interest in something that might be deemed uncool, or piff, or peak, or whatever the latest nomenclature is. Perhaps it is easier to hate everything when you have very little positives in your life? 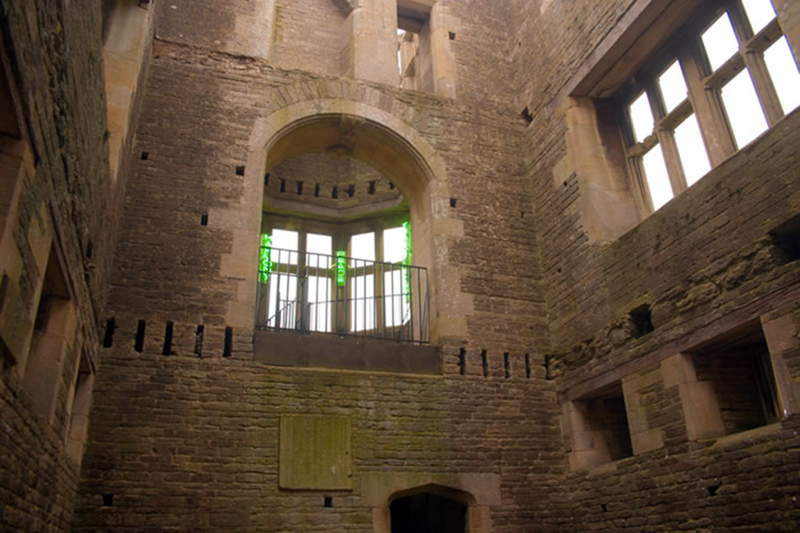 Hoping to get a closer look of Caroline Wright’s Untitled (Believe) neon installation inside Lyveden New Bield, one dextrous student clambered up to a nook that I fully imagine had been out of reach since 1605. After some time contemplating he announced “you have to admit, this is good”. It’s moments like those that make me happy, and the knowledge that the same is true for our students at some point on their journeys and encounters with art. This entry was posted in Education, News and tagged Alternative Mondays, Alternative Provision, Caroline Wright, Jitish Kallat, Rebecca Lee, Shane Waltener, The CE Academy. Bookmark the permalink.